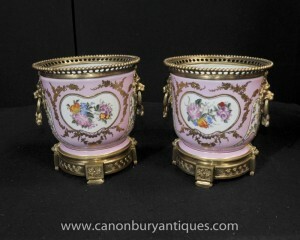 You are viewing a gorgeous pair of English porcelain Royal Derby style urns. I hope the photos do this stunning pair some justice, they’re certainly better in the flesh. 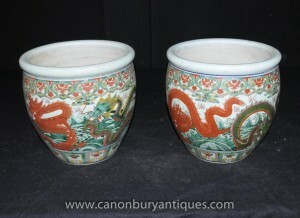 AT nearly two feet high, they’re an impressive size with gorgeous designs hand painted onto every surface of the porcelain. The brush work is incredibly detailed and intricate, particularly the gold arabesques and curlicues. Also note the wonderful classical shape with the wide brim large handles leading to the lions foot pedestal. 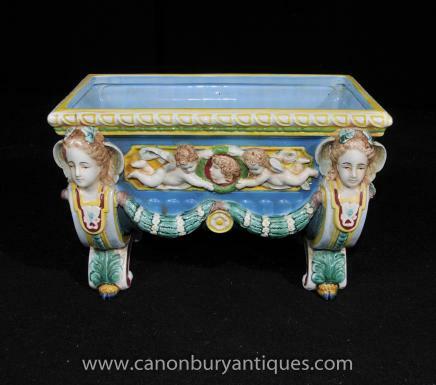 The Royal Crown Derby Porcelain Company is a porcelain manufacturer, based in Derby, England. The company, particularly known for its high-quality bone china, has produced tableware and ornamental items since approximately 1750. 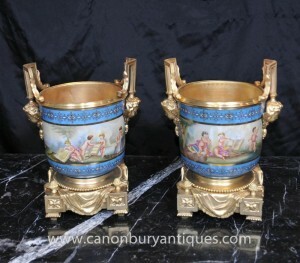 Both urns are offered in very good condition ready for home use right away and we will ship them to anywhere in the world.